The demand for quality and innovative solutions is the common thread running through the complete product range of the plant manufacturer from Upper Austria. The spotlight is especially on the new stationary series TOWERMIX® playing in a new league due to its outstanding performance portfolio. To achieve highest concrete qualities, two counter current planetary mixers, installed in the centre of the plant, are producing 3000 l and 1500 l hardened concrete per batch. The plant comprises ten chambers for up to 875 m3 of aggregates as well as a store for seven different kinds of cement is situated directly on the premises of the site. Weighing is carried out by a weighing machine and a state-of-the-art microprocessor control ensures precise controlling of all processes of the mixing plant. For the environmental protection, the plant is provided with an innovative recycling equipment for residual concrete. That residual concrete from the mixer trucks and the prefab element production can be reused in the mixing process. The different aggregates are delivered by lorries and directly unloaded into the respective truck hopper. The tower is filled by a discharge conveyor belt and a bucket elevator especially designed by SBM. Filling the cement store is very easy due to a central blowing station at the silo building. Two extra-wide lanes ensure quick loading of the mixer trucks to cart off the produced concrete. As with all other plants, SBM has made sure that TOWERMIX® is easily accessible. The operators can reach the mixing area directly from the control room and all other service levels can be quickly accessed by the comfortable stair tower. Spare or wear parts can be replaced easily and simply due to an integrated crane. It is very simple to install technical upgrades of the plant such as fibre dosing. Full production even at low temperatures is not an issue for TOWERMIX®. A heating system installed in the plant, a warm-air heating for the ten different aggregates as well as a water heating system for both mixers ensure the required concrete temperatures to facilitate smooth year-round operation of the plant. Due to the optimum planning to the existing works considering the works logistics, the capacity planning and the design of the components, and the joint planning of the three-storey company building, the turnkey and ready-for-operation plant concept TOWERMIX® scored also with the company Traub GmbH & Co. KG, a producer of prefab and prestressed concrete parts. The building company trusts in the quality and the know-how of SBM as confirmed by managing director and owner Dipl.-Ing. Franz Traub: "Our old plant had to be replaced. It has been especially important to us that the new investment fulfils all state-of-the-art requirements of modern concrete technology and that it can be perfectly integrated into our works. We have been convinced by the complete performance of our partner SBM, and we are very satisfied with the production result." The area of the family enterprise that Dipl. Ing. Franz Traub has been managing in the second generation since 1984 is situated at the edge of the town Aalen/Germany. With a total of almost 55,000 m² hall space and a modern vehicle fleet the company ranks among today's leading prefab and prestressed concrete factories in Southern Germany. 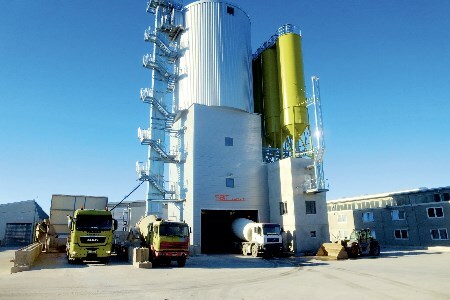 SBM Mineral Processing GmbH located in Oberweis near Gmunden/Austria is the only full-package supplier for mobile and stationary concrete mixing plants for ready-mixed and prefab concrete as well as mineral processing and conveying plants for the raw material and recycling industries. Due to many decades of experience, SBM Mineral Processing offers high-quality plants for mineral processing and concrete technology that convince regular and new customers alike.